My fourth Betta fish. I can't resist these beautiful creatures! check out my tips page for step by step guides to drawing fish fins and scales. Chameleons are another creature l have a very soft spot for. 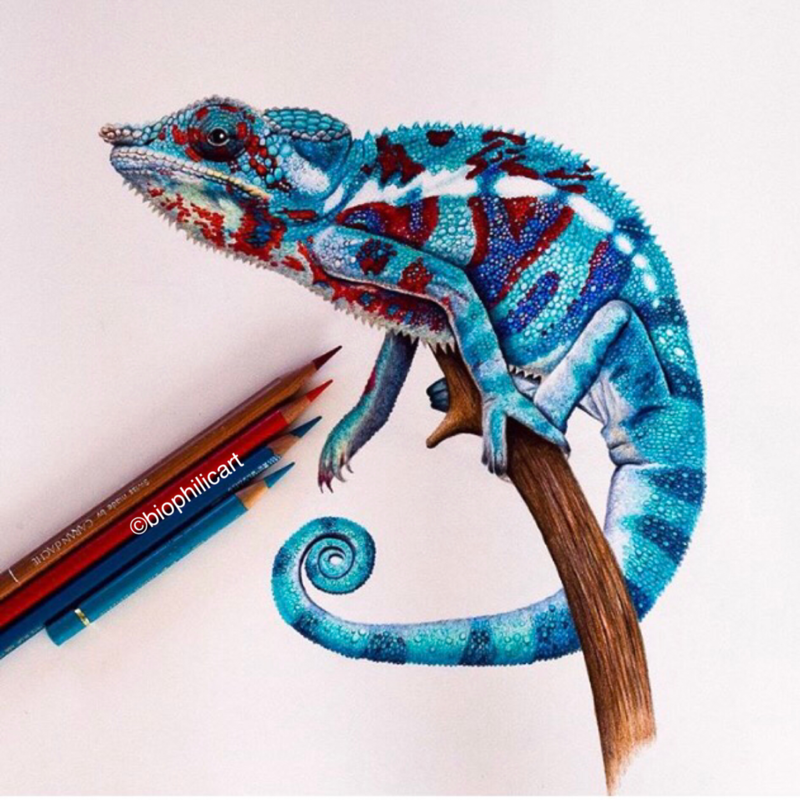 This is my second chameleon drawing. 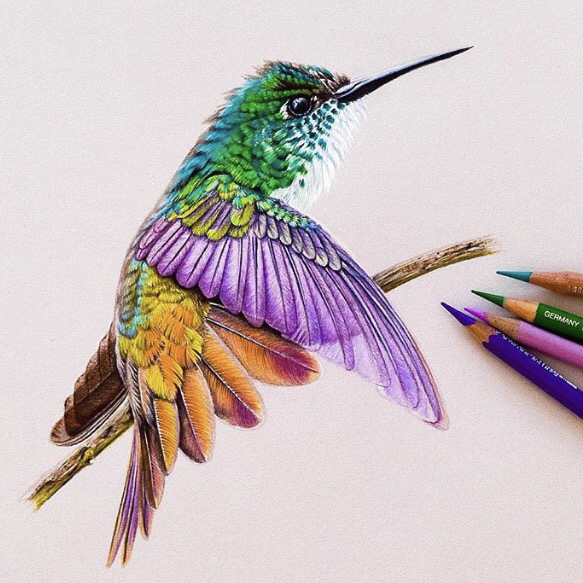 This hummingbird l dont have a positive identification for. l think it might be a Calliope? lf anyone can positively id it for me l would be so grateful to hear from you. This was another photo from the amazing StephenJayPhotography. You can find him over on Facebook, his link is in the post below. 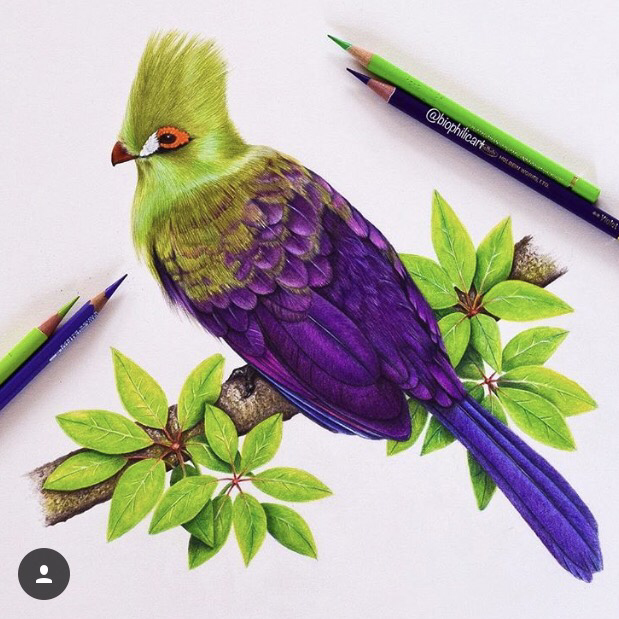 The Turaco was a completely new bird to me and l am so excited to have found it, l certainly have more on my to do list! 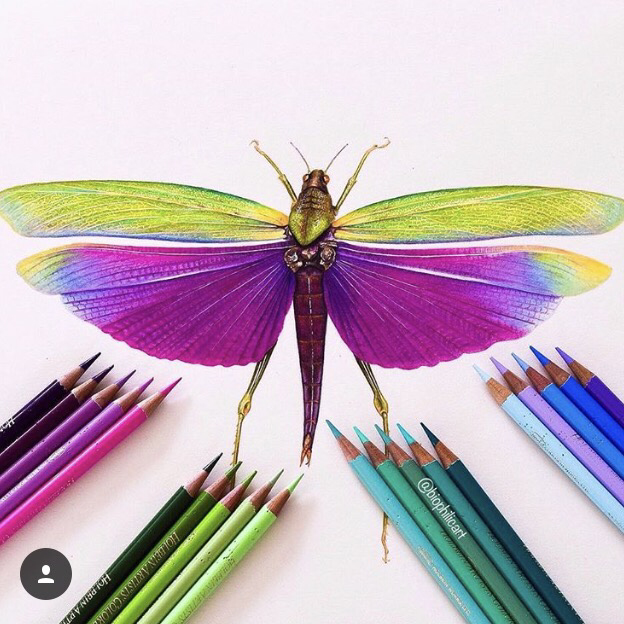 Purple Winged Grasshopper. I really had fun with the textures on this piece. 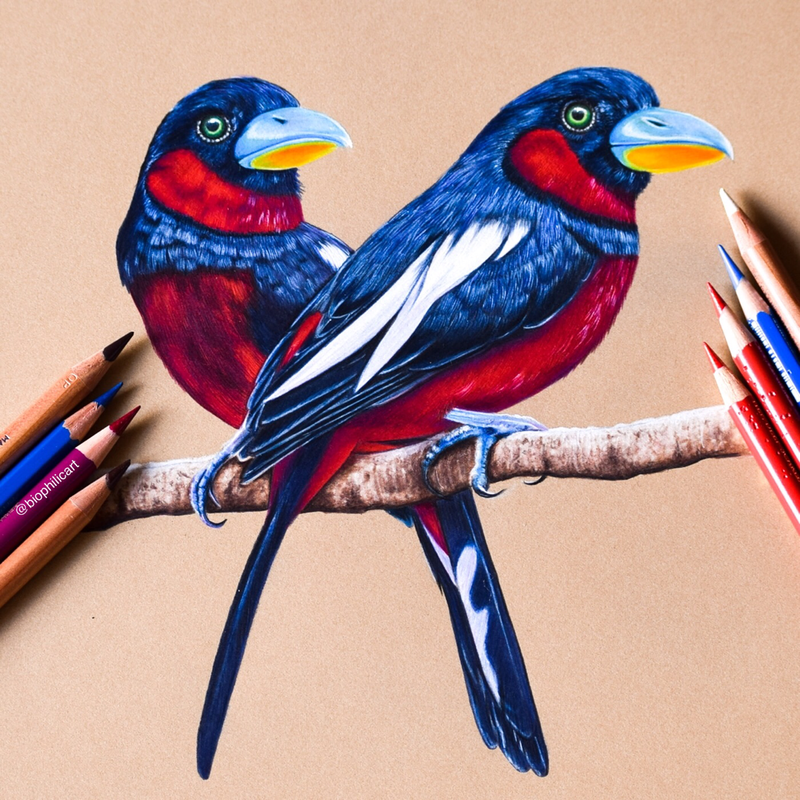 There is a tutorial on drawing the wings on my tips page. Sugar Glider on a water melon drawn as always using colored pencils. I couldn't resist drawing this beautiful little Sugar Glider with those huge eyes and of course the lovely pop of colour from the vibrant water melon. 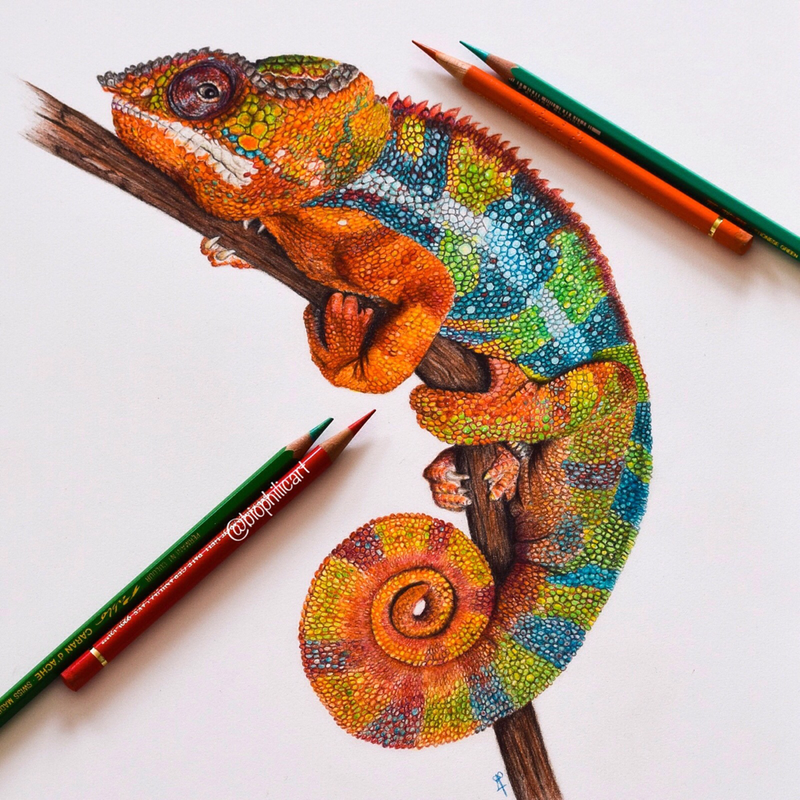 Panther Chameleon displaying his night time colors drawn using colored pencils. 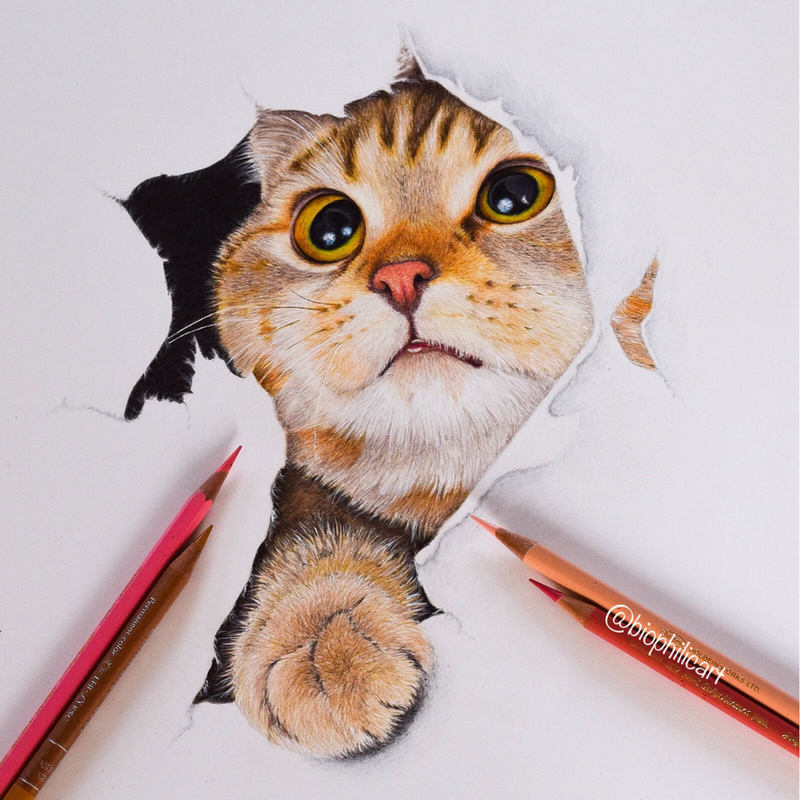 A very cute kitten peeping put through a torn piece of paper. You will find a step by step guide to drawing cat fur on the tips page of my website. This piece is available to purchase. My first Red Eyed Tree Fog. Lion Fish. I first drew this exact same photo just over a year ago. I will do a blog post so you can see that drawing all day really does help you to improve! 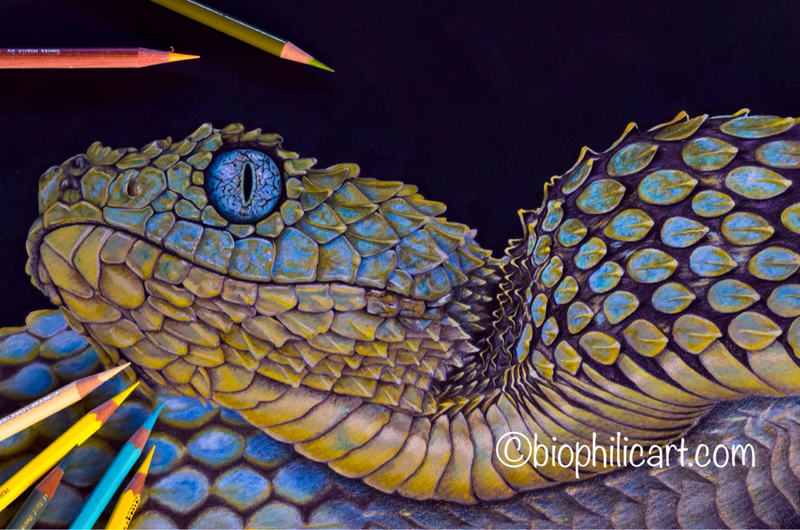 Bush Viper, this piece was my first time using Crescent mixed media board, which l really liked, and l used Faber Castell Polychromos and Caran D'Ache Pablos and Luminance pencils. See the tips page for a step by step guide to drawing the scales. Chipmunk on Walnuts. Gorgeous little sleepy chipmunk who has eaten far too many walnuts. 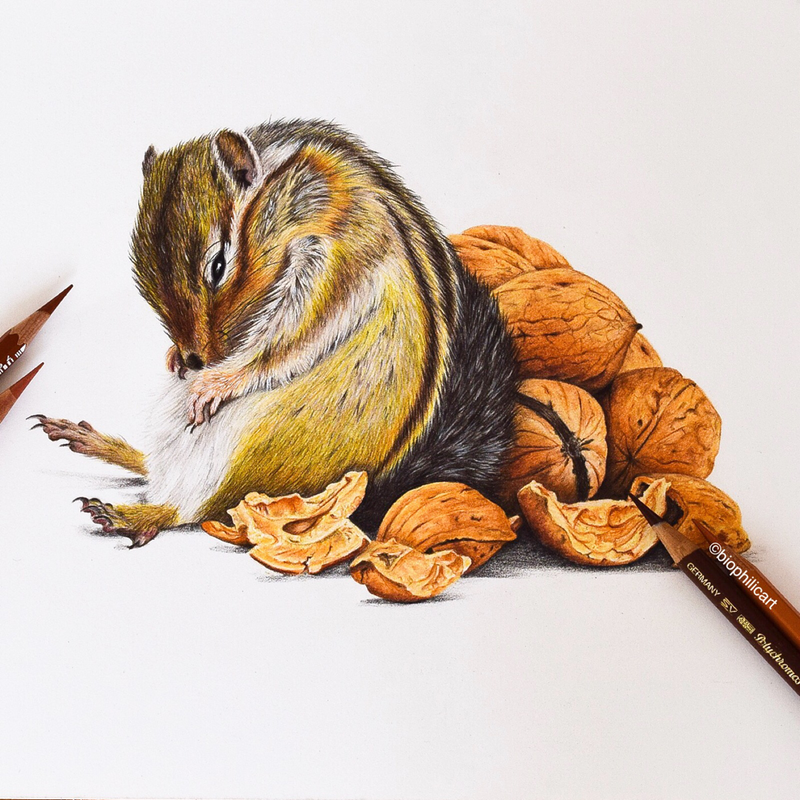 He was such fun to draw and l got to draw nuts, a first for me! The Kitten. 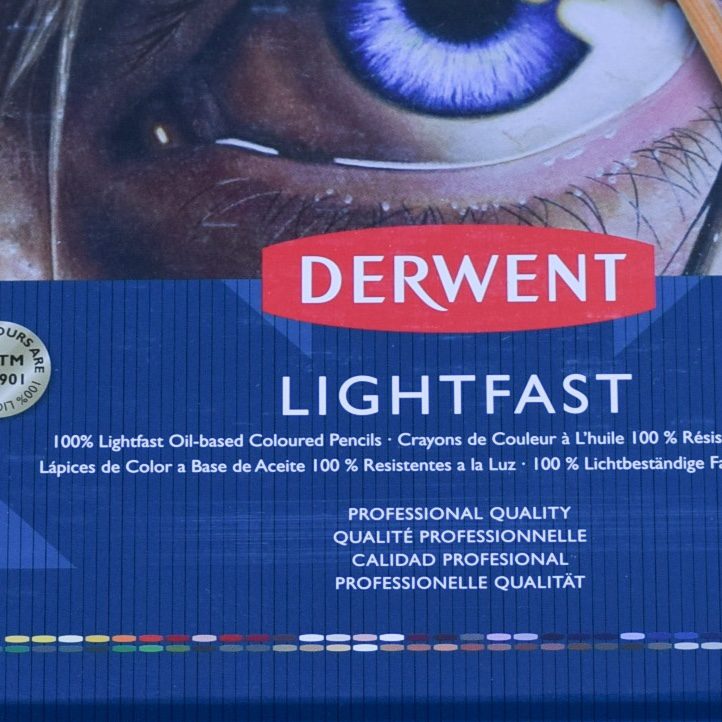 Having drawn several cats, but never a kitten l thought that the time had come and when l saw those gorgeous big grey, blue eyes l knew l had to draw them, and it was such a pleasure to draw. I love drawing eyes and just wanted to capture all the expression in this little kittens face, even though it does make me feel a teeny bit sad! The Dormouse. I am still feeling the need after drawing the last Eagle Owl for a little light and prettiness, and what could be cuter than the gorgeous little dormouse peeking through the yellow flowers. I can't tell you just how much l have enjoyed drawing him. The Painted Lady Butterfly. After drawing the second Eagle Owl, l felt the need for a little colour in my artwork. I have been wanting to draw a butterfly for quite a while so when l came across this gorgeous reference photo l was really excited. The Snow Leopard. I have wanted to draw a Snow Leopard for quite a while now. 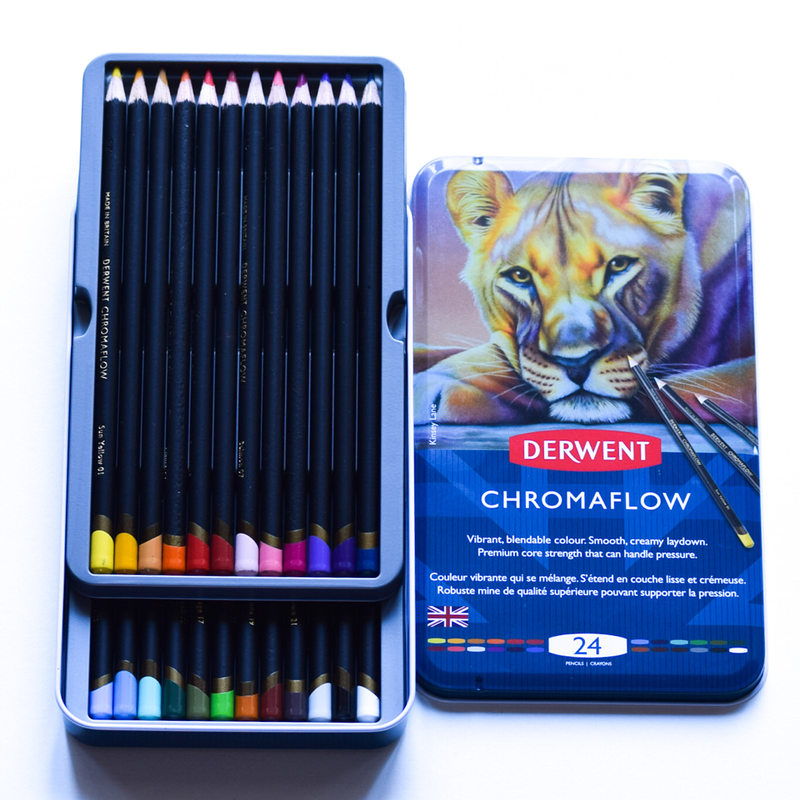 I love wildlife art and drawing wildlife of all kinds, and big cats are just beautiful. I fell instantly in love with this gorgeous leopard cub on first sight. He is only young, but seems to have had quite a life. The top of one ear appears to be missing and he has a big scar on his nose. And that look in his eyes! This was such an exciting piece to draw. This gorgeous chimp was a piece of wildlife art that l could not resist drawing. One look at those eyes and l knew l had to draw the little fellow. He was quite a challenge for me, but l so enjoyed working on him, and was quite sad when he was complete.